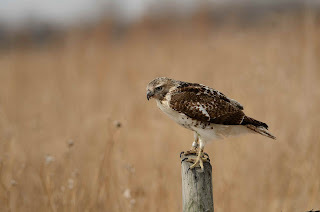 One bird that I think is super hard to photograph is a hawk. These guys are super hard to approach and almost always fly off before you can get some glass on them. Roger and I are driving my little Honda looking for Sandhill cranes when I spot this bad boy hanging out. So I drive past him a little ways and turn around. Driving slowly not to spook him in anyway. Surprisingly he does not fly off when I stop the car. I grab my camera out of my lap and take a few - Rats - I have my 70-200 on. This guy is going to fly off. So I ask Roger to grab my backpack that was right behind me. Still the Hawk stays put. Change lens. Hit the hammer. I can't believe he stayed put. If you click on the pic it looks like he just got done eating. Maybe he was super full and was just resting. Don't know and don't care. He also has a band on his leg. I know - I will get to the Cranes soon. Be patient.